Associate Professor Joey Lau Börjesson at Uppsala University has been collaborating with CELLINK to print human pancreatic islets in PAN X. We are glad to share her preliminary results here below. The aim of this study was to utilize 3D bioprinting in order to create a favourable microenvironment for transplanted insulin-producing cells. 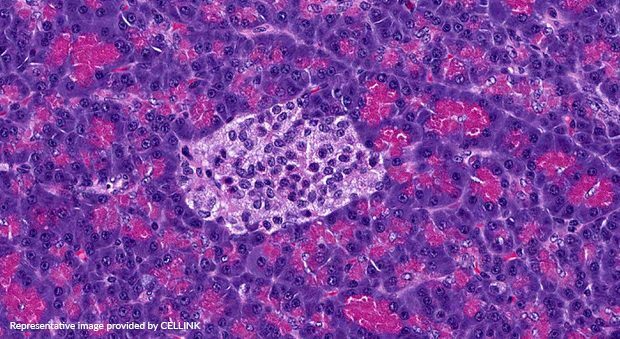 The pancreatic islets of Langerhans have a dense network of blood vessels facilitating delivery of the produced hormones which regulate the blood glucose levels. The insulin producing beta-cells in the islets of Langerhans can meticulously ”sense” the blood glucose levels in the blood since the blood vessels are very close. In type 1 diabetes, the insulin producing beta-cells are attacked by the immune system resulting in a progressive loss. Islet transplantation is a treatment option for a subgroup of patients with brittle type 1 diabetes. Islets are infused into the liver via the portal vein. However, the function in the transplanted islets decline with time since the microenvironment in the liver is not an optimal milieu for survival and function of transplanted islets. Beside here is an image of the groups 3D bioprinted islets with intact morphology. The 3D printed islets is stained with hematoxlin and eosin. 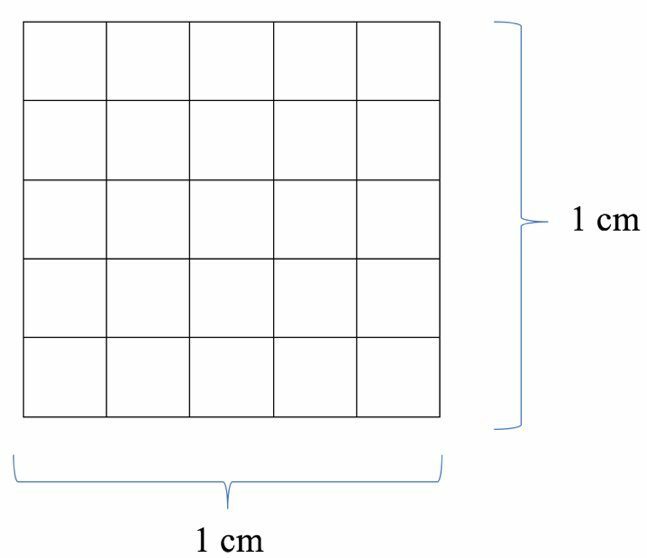 Scale bar 100 µm. Joey and her group used the 3D bioprinter INKREDIBLE to bioprint human islets with the CELLINK bioink PAN X. PAN X is a bioink with extracellular matrix proteins derived from human pancreas and used in order to mimic the physiological microenvironment for the islets of Langerhans. The group mixed human islets with the PAN X bioink and bioprinted grid-shaped constructs, seen in the image beside. After bioprinting, constructs were crosslinked with crosslinking agent followed by washing with phosphate buffered saline. The constructs were put in the incubator for 30 min before a glucose stimulated insulin release test was performed. The constructs and control human islets (i.e. 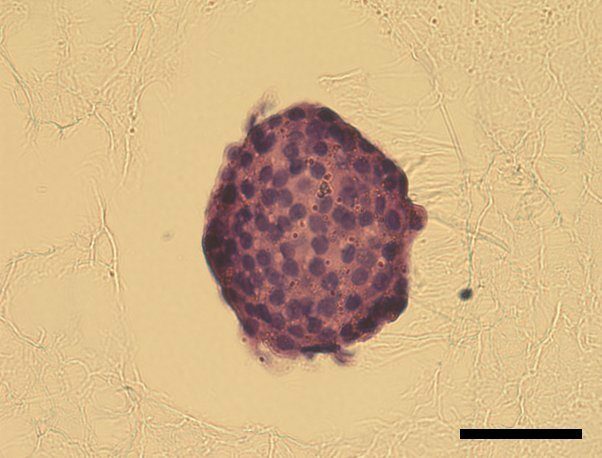 not bioprinted human islets) were incubated in low glucose (1.67 mM glucose) for one hour followed by one hour incubation with high glucose (16.7 mM glucose). Constructs were then put in culture media and incubated overnight. Glucose stimulated insulin release were performed once more for the same constructs to evaluate function over time. The result of the glucose stimulation can be seen in the graph beside. 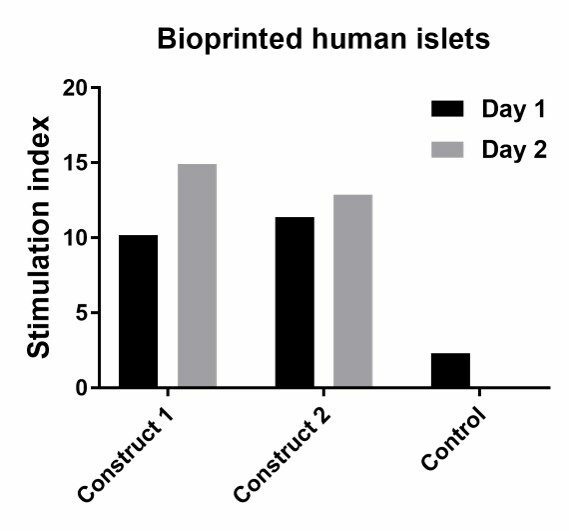 Glucose stimulated insulin release were performed on the bioprinted human islets in PAN X on the same day (Day 1; black bars) and on the following day (Day 2; grey bars). The constructs were also processed for future histology analysis. Preliminary results show that the function in human islets is improved when bioprinted with the bioink PAN X. Moreover, the human islets demonstrated intact morphology after bioprinting.